It’s officially Fall which for us yarn-y types, which means the fun begins! Sure, we knit & crochet year ’round, but it’s when the first chill creeps through the relentless-wall-of-heat-that-is-the-summer, that we can really curl up and enjoy stitchin’! To wet your needle-wielding whistle, why not start with a staple accessory to keep your topper toasty and your outfits outstanding? Yes, you chicks with sticks and dudes with…ummm…dowels; I’m talking about the beanie. They’re fun to make, and everyone needs one. Sounds like a win-win to me! Here are 8 hats for man, woman and child, that can be whipped up fast and worn immediately! The Urban Jungle slouchy beanie is crocheted out of Simply Soft, using the puff stitch. You can nab the pattern for free over at Caron.com. Oh, and if you need a little how-to help with the stitch pattern, check out my video tutorial here. with experience. It’s knit in simple, 2×2 rib stitch and in chunky, organic camel yarn. Do you dig it? I knew that you would. This pattern along with 30 other classic, eco-aware projects are available our book, AwareKnits (Knit, Purl, Save the World-UK Edition). Find it here. The Puffalump beanie is for the bi-stitchual amongst us. Using a double-strand of worsted-weight yarn, the main body is crocheted in a bobbled stripe pattern. The brim and crown are each knit, by picking up stitches around both sides of the crocheted pieces. Get the pattern on my website, here. The Urban Planner is the knit version of the aforementioned, Urban Jungle. The yin to its yang, as it were. It’s another design I got to do as part of my partnership with Caron. The pattern’s available on their website, along with another of my video tutorials showing how to seam it up. This hat uses the Blackberry stitch and variegated yarn, which you can find here. Mary-Kate, is more of a beret than a beanie but hey, let’s not mince words in the name of crafting, ok? M-K is made with a large hook using yarn with just a little shimmer. This project, along with its companion wrist warmers, is nestled amongst more crochet goodness in, Pop Goes Crochet. Shady, utilizes double-strands of yarn to blend colors taking then from black, to variegated, to green. Then, a simple rib pattern gets a twist at the crown for a little, unexpected texture. Get Shady, here. Sim Luttin is a contemporary jeweler who lives and works in Melbourne, Australia. Her current work, Melancholy Series, poetically explores notions of beauty, nostalgia and passing time. Luttin’s jewelry pieces question how the creation of objects can guide or replace memory. As intimate objects, Melancholy Series alludes to forms found in nature, while deliberately abstracting them in order to de-familiarize the familiar. From quilting to felting to scrapbooking, Trice Boerens is a designer who can handle it all. Over the years she has created for a variety of companies, including her most recent book with Lark, 45 Quilt Blocks: Flowers. We were lucky enough to get a minute of her time this week to find out more about the woman behind the designs. Trice, how did you get your start crafting and quilting? My Mother was pretty handy and she had me convinced that she could do anything. A female MacGyver with a 60’s bubble-cut, she once restored a torn page from library book with glue, wax paper, and an emery board. Each year when spring rolled around she felt that it was her duty to make Easter dresses, and with four sisters that meant a lot of fabric scraps. I claimed the scrap pile and started making crazy quilts. Not crazy quilts, but crazy quilts. Free-form, asymmetrical quilts made from cotton, eyelet, jersey, or polyester (depending on what we saw in Seventeen magazine that year). Sidebar, on my To-Do List is: “Write a proposal for a quilt book titled Insane Crazy Quilts.” Is that offensive? I hope not because it practically writes itself! Wanna make a hyperbolic crochet coral reef? So, you ask, where can I find a beautiful meeting place for geometry, yarn, and colorful ocean life? Look no further than the incredible Hyperbolic Crochet Coral Reef! "Crochet Coral and Anemone Garden" with sea slug by Marianne Midelburg. Photos © The IFF by Alyssa Gorelick. The brainchild of sisters, Margaret and Christine Wertheim of the Institute For Figuring, this ever-evolving crochet reef started as an homage to the Great Barrier Reef near their childhood home in Queensland, Australia. After years of creeping growth, the oceanic masterpiece overtook the sisters’ living room and branched out to many spacious homes in exhibitions worldwide. According to their website, the crochet reef has become possibly one of the globe’s largest community art projects. Click “Continue reading” for a how-to guide on hyperbolic crochet, info on becoming involved in the project, images of the crochet reefs, and a video TED talk from Margaret Wertheim (one of the project’s originators). Hey there–thanks to so many of you for your enthusiasm for (and participation in) our Glee Twitter Party with Vickie Howell. We loved hearing about your crafty ideas, your Glee opinions, the results of your “which Glee character are you” surveys, your savvy answers to Glee trivia questions, and your amazing Halloween costume ideas that include Glee. (I now feel that I simply must try to create an Emma costume). Giveaway of a seven-book bundle of 500 Series books from Lark Jewelry & Beading! Our giveaway of the complete set of Lark Jewelry 500 series books last month generated the most comments — more than 450 — of any post in the history of the Lark blog. But conspicuously missing from that giveaway were seven other books — non-jewelry titles in our 500 series that nonetheless are great titles from the Lark Jewelry & Beading team! So hold on to your hat pins: We’re now giving away a fantastically diverse bundle of seven 500 series books: the newly released and incredibly beautiful 500 Judaica, along with 500 Metal Vessels, 500 Enameled Objects, 500 Knives, 500 Beaded Objects, 1000 Glass Beads, and 400 Polymer Clay Designs. How to enter for a chance to win the bundle? Leave a comment on this post by 9 p.m. EST on Monday, October 4. Any post is fine, but you’re welcome to leave a comment letting us know which of these books you’re most excited to own — and why. One winner will be selected at random and announced on Thursday, October 7. Click here for the official rules. And good luck! To celebrate the release of Sew Tina! with fabric designer Tina Givens, we’re throwing a little eparty! And you get the goods: three free projects, a chance to win a copy of the book (and other treasures), and a months worth of Tina – welcome to the first stop on her official blog tour! Read on for the blog tour schedule! What a lineup! At each stop, you’ll hear from Tina (of course!) and get plenty of chances to enter to win the book.We’ll check in along the way and keep you posted on all the fun happenings. Also, here are three free projects to get you in the mood. Make the Olly the Owl, the Skull Cap, or the Duvet Cover & Sham… Or all three! Oh, and did we mention a giveaway? We did! Enter for a chance to win a copy of Tina’s brand new book (Sew Tina!) and a bundle of goodies from Tina (including fabric and stationery). Leave a comment on this post by 9 p.m. EST on Friday, October 29th. Any post will do, but you’re welcome to leave a comment letting us know which Tina fabric is your favorite. One winner will be selected at random and announced on Tuesday, November 2. Click here for the official rules: http://www.larkcrafts.com/uncategorized/sweepstakesrules/. This giveaway has ended. Thanks so much for all the fabulous comments! Stay tuned: the winner will be announced on Tuesday, November 2. Drum roll, please…. the winner is Lauren, who said “love the bedding set (especially the pillow! )” Congrats, Lauren. Sew Tina goodness is on its way! As this week’s beading bonus, I selected the Helixa Necklace from Sarah McConnell’s One Big Beautiful Bead. I just love the elegant rope made with a Russian spiral technique–it’s something I’d like to try my hand at. If this is something you’ve been wanting to learn, too, click right here for the free instructions as a PDF. From Asheville, North Carolina, it’s This Dog’s Life. I’m Ira G. Each FRIDAY, of course, I pick a theme and present a story around that theme. Love crafts? 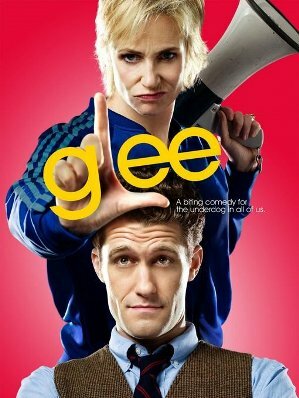 Dig “Glee”? On Twitter? Join me for a Twee Party! Unless you’re living in a cave, you’re bound to know that the latest season of FOX’s musical mega-hit, Glee, debuted this week–oh, and the term “glee” is exactly what this show brings me! Even if you’re not like me though (a theater geek at heart with a slight obsession with dance movies), you’d be hard pressed not to at least crack a smirk when the quick tongue of the snarky Sue Sylvester begins to wag. Seriously. So my friends, we here at LarkCrafts.com decided that no only shall we wait with great anticipation for next week’s Glee installment, we will also host a Glee Twitter Party (a Twee Party, if you will) in its honor. That’s right, an hour of unabashed tweeting amongst us crafty types, about the show we love and the projects that could (even loosely) go along thematically with it. Why, you ask? Because crafters are Gleeks, too. That’s all there is to it! Join me to swap high school, theater, and glee club-inspired project ideas (Got the perfect pattern for Rachel-centric halloween costume? Excellent. Decoupaged your locker with Glee-isms? We wanna see it! ), get links to free patterns, and answer Glee trivia questions to win loads of Lark Crafts’ books! What IS a Twitter Party? A Twitter Party is where a group of people can discuss or “Tweet” about a specific topic in their own little chat room. To participate in the discussion you’ll need to sign up for a free Twitter account (instructions are listed below), if you aren’t already on Twitter. Twitter parties are a great way to connect with other people while chatting about a specific topic. Lark Crafts will be hosting a lunch-hour Twitter Party as our crafty ode to Glee. Oh, and there’ll be prizes, too! Twitter Party Hosts oversee the event, answer questions, and keep the flow of the party going. 1. Twitter Account – Go to www.twitter.com to sign up for a free Twitter account. During the party if you want to address one of the hosts directly, be sure to use their entire Twitter handle (ie @VickieHowell). Hashtag – The Twitter world calls a pound sign (#) a hashtag. A hashtag is a code used to mark a specific topic. The Lark Crafts Glee, Twitter Party is marked and happening at #Larkglee. You can search for #Larkglee to participate in the party and see the party tweets. Set Up TweetGrid – On the day of the party, use TweetGrid.com or another Twitter application such as TweetDeck or Hootsuite to follow all of the “tweets” marked #Larkglee and participate in the party. On TweetGrid – You can comment, reply and read all at once in TweetGrid, and it even puts the hashtag in your comment for you. Click here for a TweetGrid tutorial list. The Twitter Party Tutorial should be #8. Not Another Teen Knitting Book, goes digital! Especially for the Lark Craft’s Twee party, my 2006 book, Not Another Teen Knitting Book, has been re-published in digital form–you can download it from Zinio now! Whether you’re a jock, cheerleader, nerd, prep, or undefined–NATKB has a project with your name on it! Here are just a few.